Today, Microsoft launched the SQL Server 2008 Experience, which is a new web site that helps Microsoft’s customers and partners learn behind-the-scenes details about about SQL Server 2008. The launch of the SQL Server 2008 Experience kicks off a worldwide readiness outreach that will reach over 350,000 customers, partners and community members through in-person events over the next year. 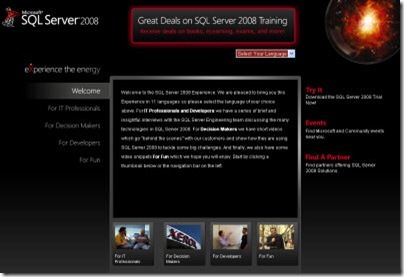 The SQL Server 2008 Experience web site features over 500 rare video interviews with people from SQL Server engineering and with several SQL Server customers. Each video is available in 11 languages including English, French, Chinese (Simplified and Traditional), Portuguese, Italian, German, Japanese, Korean, Russian and Spanish. Customer videos showing how SQL Server 2008 is helping them be more successful. Some customers featured include Xerox Corp., Baltika Breweries and DriveCam Inc.
We invite you to visit http://www.SQLServerExperience.com today.